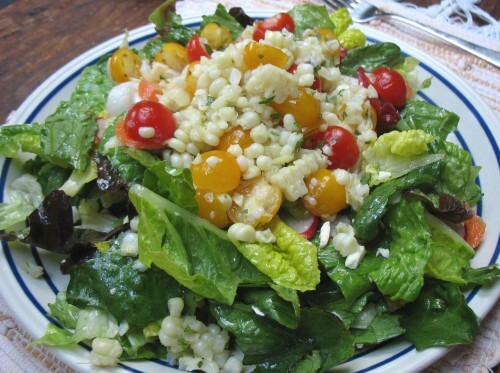 This easy summer salad has been in my repertoire for years. When I brought it to little Hendrix’s 2nd birthday celebration in early July, so many friends commented with smiles that I thought you might enjoy it as well. The combination of fresh corn and sweet little tomatoes may not be new, but it’s always a winner. Mild, seasoned rice vinegar adds gentle tang so very little oil is needed. Healthy! Shuck corn and cook as desired,* or try this clever microwave method (corn cooked in the microwave in the husk! a 2-minute video.) Submerge cooked corn in ice water for 10 minutes to “kill the cook”. Drain and refrigerate until ready to make salad. Cut kernels from corn and place in a medium bowl; kernels do not have to be all separated. Cut tomatoes into halves; add to corn. Stir in chopped herbs. Sprinkle with seasoned rice vinegar, oil, salt and pepper; toss to coat. Taste and add more vinegar, salt and pepper to taste. Serve as is, or add to a tossed green salad. Double recipe to make 8-10 servings; use 1/3 cup vinegar and 2 Tbsp oil. * Substitute cilantro for parsley, if you like. – It’s best to under-cook corn a bit to use in salads, so the corn has some crunch. – The microwave cooking method is great for salads. But if you need more ears for dinner, it’s better to boil them in a big pot. Yup, the seasoned rice vinegar is a good match with the sweet tiny tomatoes and sweet corn. Let me know if you try the microwave method for the corn! Wacky, but it works. The microwave husk removal is brilliant! It works pretty well for BBQ corn too which is how I most often cook corn. My theory is it works because the silk is pulled from the opposite direction that it grows. Rosie, others have mentioned the grill/BBQ method. Do you soak the corn-in-the-husk first? When we have family lobster bakes in Maine, we put all the corn in a mesh bag and throw it in the lake for an hour or two. Then the ears are put on the wood fire (grates on top of course). Like the microwave, the husks and silk come off easily. Oooh, that mild smokey-flavored corn is good!